Despite my acerbic comments made while reading, I found myself enjoying this book much more than I thought I would, especially once I got past the first two parts, which chronicle the collapse of Western civilization. As a novel, this book is a real stinker; if there were negative stars on GoodReads, this tome would deserve them. What it is, is an analysis of modern, capitalist, consumption-driven culture and the inherent weaknesses that are most likely to bring it down, and an interesting speculation on what the author believes should replace it. Namely, a socialist anarchy where there is “no individual property in anything but personal belongings and money.” (Part 3, chap. 5, “The First Conference at Basra: 1965”) (I downloaded my copy from Project Gutenberg and don’t have pagination.) You may not like what Wells believes the answers to our problems are but they’re interesting and reveal an astonishing imagination capable of “thinking outside the box” (forgive the use of the already trite cliché). This compares to Olaf Stapledon’s Last and First Men, though Stapledon’s vision is far, far broader and doesn’t continue the conceit that Man is the culmination of evolution. My first vision of The Shape of Things to Come came when I watched a Christmas Eve showing of the 1936 film on my local PBS station as a kid. I recently reviewed the film (which fueled this interest in reading its source). The film isn’t very good, really, except for the middle part, taking place during the years of recovery. Though I like Raymond Massey in “The Scarlet Pimpernel” and “Arsenic and Old Lace,” his characters (John/Oswald Cabal) are the weakest parts of the movie. I cringe just thinking of Oswald’s final oration as his children fly off into space. 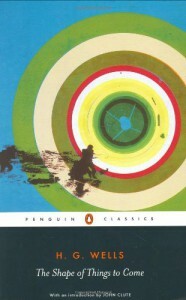 As a novel, if the book were modeled on the movie’s structure, it might merit more respect – I see it following another apocalyptic novel, A Canticle for Leibowitz (a favorite): The first part would be set during the collapse of the West; the second part would occur during the reconstruction; and the final section would be set in the civilization that eventually emerges. Regarding the novel, Wells sets up the conceit that a scientist of our own era has received messages from the future purportedly showing what happens between the end of the Great War (1918) and 2106. It’s unexplained and unexplainable and ironic in the face of the fact that Wells’ future society rests on supremely rational, scientific and secular principles. Fortunately, the author pretty much ignores the premise throughout the remainder of the book. In a paragraph that rings eerily and frighteningly apropos considering current events (and as an example of his insight), Wells writes “the immediate causes of the world collapse in the twentieth century were first monetary inadaptability, secondly the disorganization of society through increased productivity, and thirdly the great pestilence. War was not a direct cause. The everyday life of man is economic, not belligerent, and it was strangled by the creditor.” (Part 2, chap. 12, “America in Liquidation” – emphasis mine) The “Age of Frustration” lasts from c. 1933 to 1965, when the First Basra Conference establishes the embryonic Modern World State – a civilization based upon the Marxist ideal of common property and the subordination of the individual to the commonweal. It’s not Communism as envisioned by Marx or Lenin but the committed capitalist or Chicago School economist would find little to distinguish in its outcomes. Eventually, education, prosperity and human nature produce a “revolt” that bloodlessly replaces the “Soviet” interlude (the Air Dictatorship) and allows Wells to describe the subsequent Utopia in Part Five – The Modern State in Control of Life (Wells likes the word “control,” and seems quite happy with a top-down organization of the world). This is the most absurd part of the book as Wells rhapsodizes about how (unremittingly) good life is at the dawn of the 22nd century. He’d already simplified and reduced the collapse and recovery in the interests of his narrative, and the final chapters are a compendium of man’s achievements and the great advances yet to come: unleashing the productive capacities of the soil, exploiting the mineral wealth of the earth, taming and genetically manipulating the animal and plant kingdoms (he anticipates modern debate about messing with the human genome by postulating a general consensus that humans don’t know enough to mess with it yet but that they will in the future), altering the earth’s geology (another future project), refining education and social psychology to eliminate “regressive” or “reactionary” thought, increasing the efficiency of the distribution of wealth, and (perhaps the most critical) advancing human physical and mental health (from “Sublimation of Interest,” Part 5, chap. 8: “And the greatest discovery man has made has been the discovery of himself. Leonardo da Vinci with his immense breadth of vision, his creative fervour, his curiosity, his power of intensive work, was the precursor of the ordinary man, as the world is now producing him”). A few random, final thoughts: As I write this review the hysterical, right-wing reaction to Barack Obama’s plan to speak to America’s schools on their first day back is sputtering out, and I’m listening to his address before Congress on health-care reform. I bring both these up because Wells addresses them, in a way, when discussing the world’s collapse and recovery. Regarding the latter: The greatest weakness for the Left in our efforts to join the rest of the civilized world in health-care standards is that we have no movement and no plan. The Democratic Party has a few phrases (“public option”) but no specifics so it’s easy for its opponents to raise opposition. It doesn’t help that the party’s hacks are as much employees of big pharma and the for-profit insurance industry as the Republicans. But before I get too political, let me relate this to The Shape of Things to Come: Wells argues that many saw what needed to be done (the end) in the decades before the Great War – i.e., a world state – but their efforts came to naught because they had no strategy or blueprint to follow. They succumbed to intellectual chaos and the simplistic calumniations of their opponents until a figure emerged with a coherent ideology and a plan around which people could gather. Can’t really recommend this except to Wells fans and Utopian/dystopian lit geeks but it’s full of insights into the weaknesses of our modern civilization – considering the state of the world today, Wells may have just missed predicting when and how the world ends by 50 years – and interesting (if, at times, disturbing) ideas about how to address them.